Born in May 1954 in Córdoba, Argentina. He has studied in the School of Fine arts to the University of Córdoba. 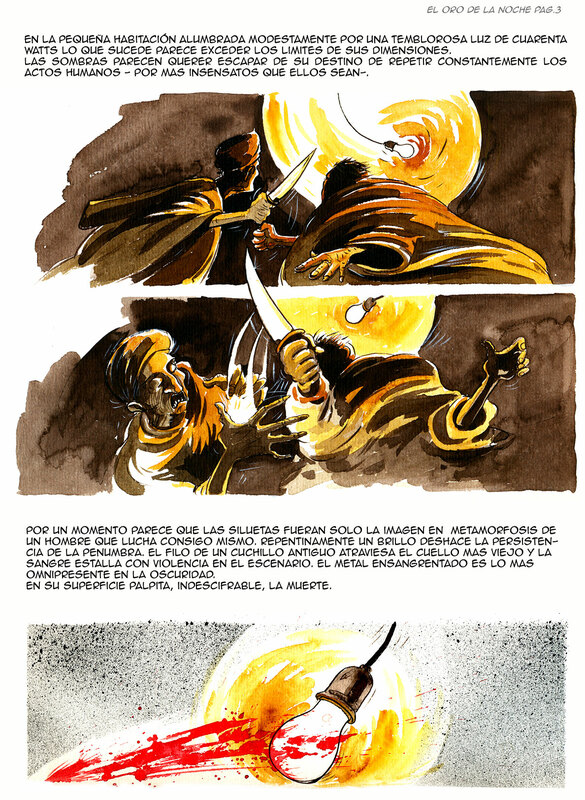 Soon Héctor begins to collaborate in different newspapers and magazines like illustrator and Comic Artist. In 1982 he has lived in Brazil where has published drawings in the newspaper " The fohla of Sao Paulo ". 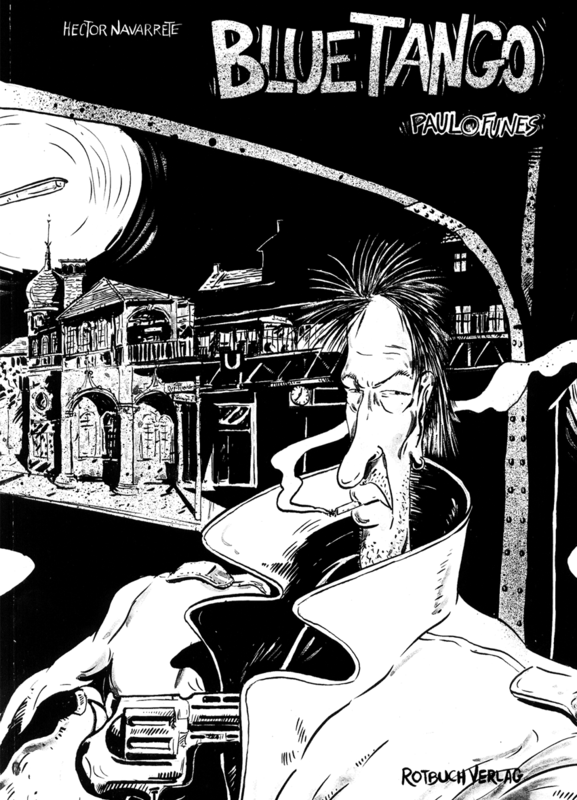 In 1983 he arrived in Italy, where besides continuing his film experience, he began to collaborate in the satiric supplement of the newspaper LA REPUBBLICA and in the creation of the magazine L' ANAMORFICO directed by Pino Zac and where Topor, Puig Rosado, Desclozeaux, Barbe, and Cardon were published. 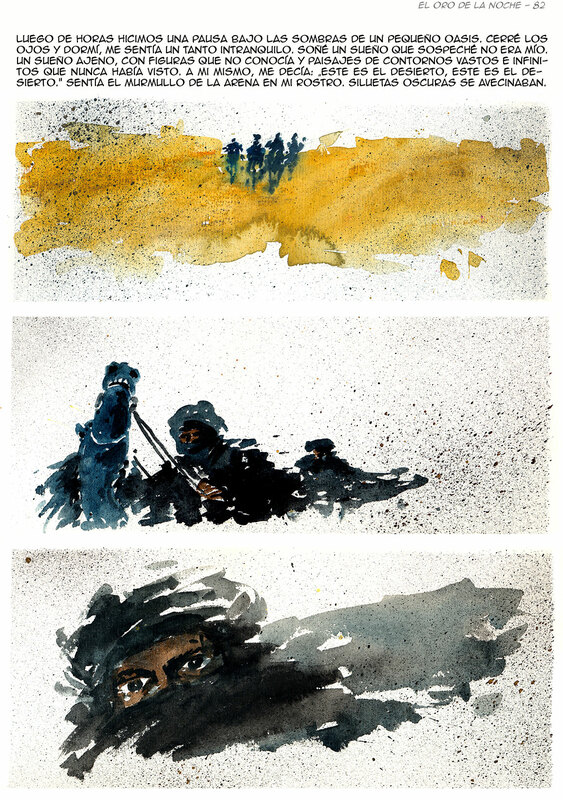 In 1986 he is transferred to Berlin where works like illustrator, Comics Author and cinematographer. 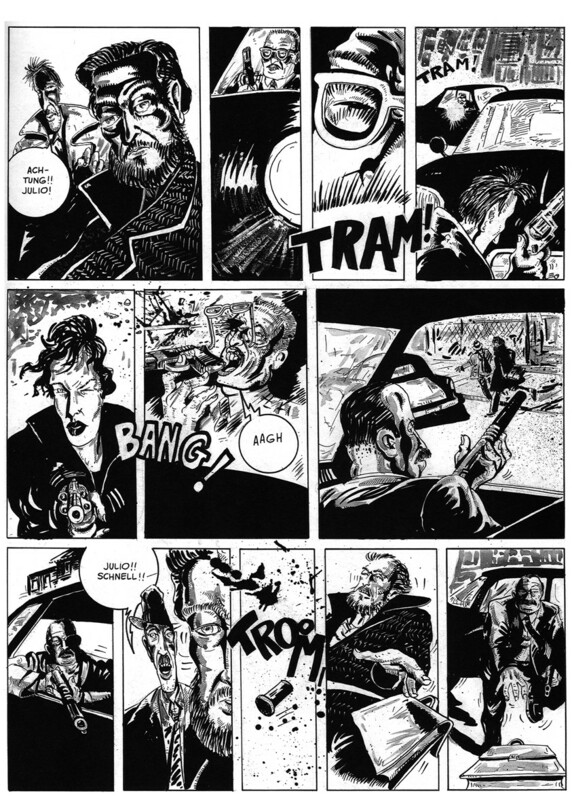 In 1989 published the graphic novel BLUE TANGO, which protagonist is Paulo Funes, a melancholic detective who came to Berlin from a distant and cold south. 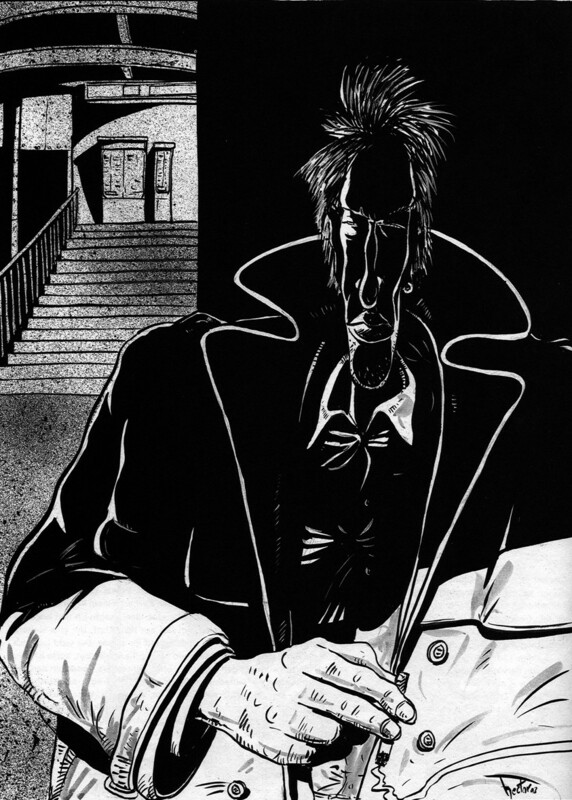 He co-operates as illustrator with Langenscheidt, Spotlight Verlag, an many others. Like a freelance cinematographer, Héctor shot with many of Germany leading TV broadcasters, including ZDF, ARTE, and 3Sat. 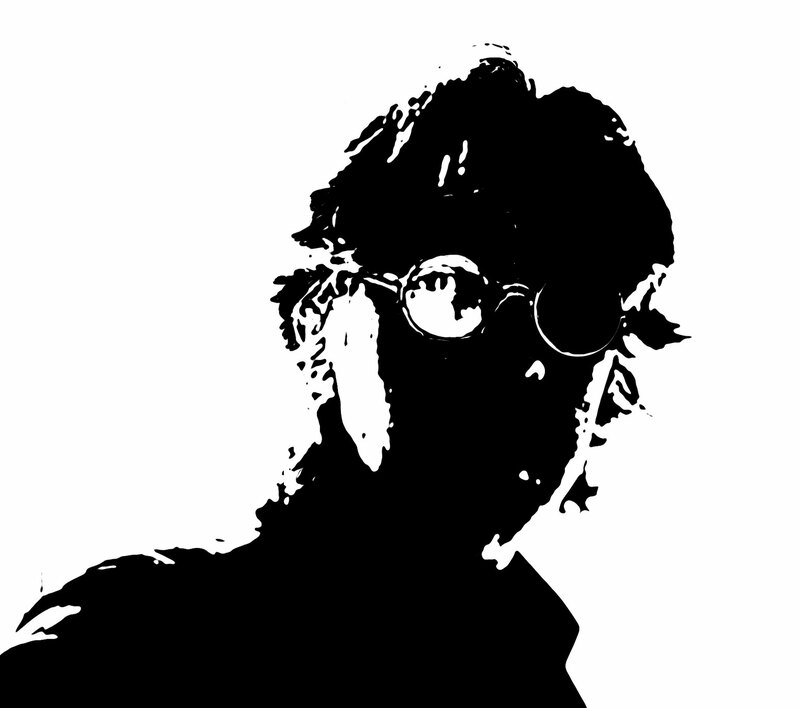 Also he worked on many project of Video Art and Animation Films. In Italy has published in “Storie”, " News Settimanale ", " Diario ", and the publishing house Leconte. Since 2007 he is German citizen. Many call him "Kanake". His true name is PAULO FUNES. 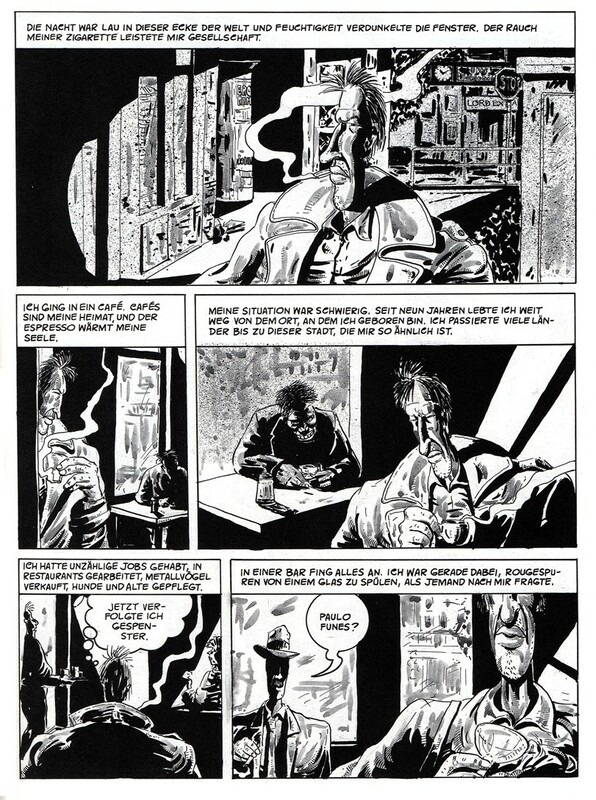 Frequently he was found in the bar drinking a double espresso and smoking without a break. 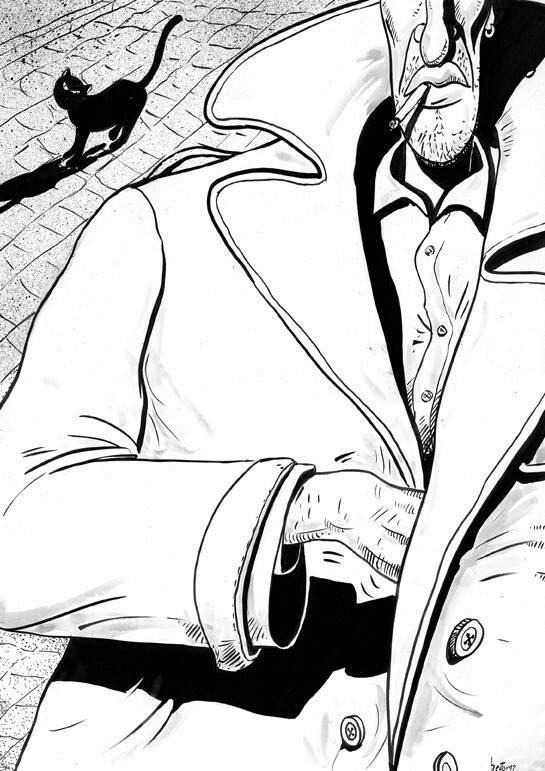 Lothar Ioselliani, private detective and his boss, tells him about a man called Borges, an rich industrial from Argentina who was looking for his son, Julio. Paulo and Julio know themselves, they are old friends. Before the way of their lives were separated, they drank from the same wine and loved the same women. 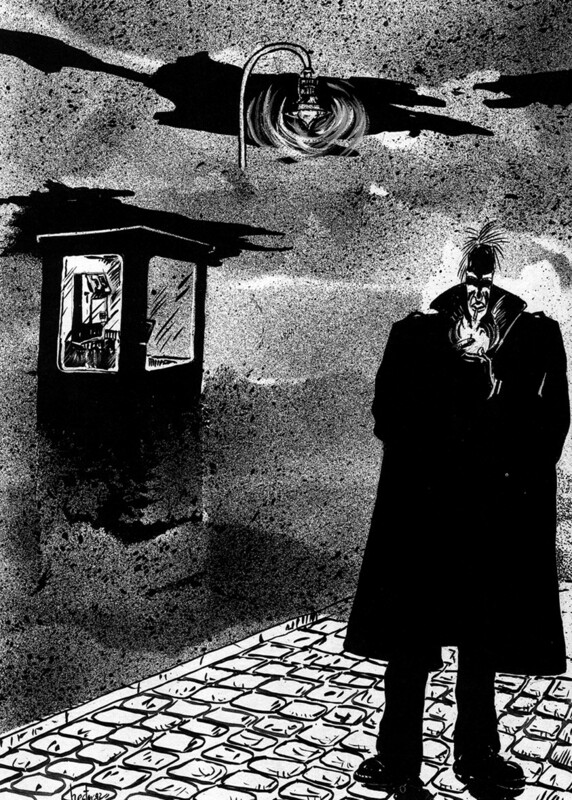 In Europe, and in Berlin where the shadows are omnipresent, Paulo Funes is visited by the past and their ghosts. 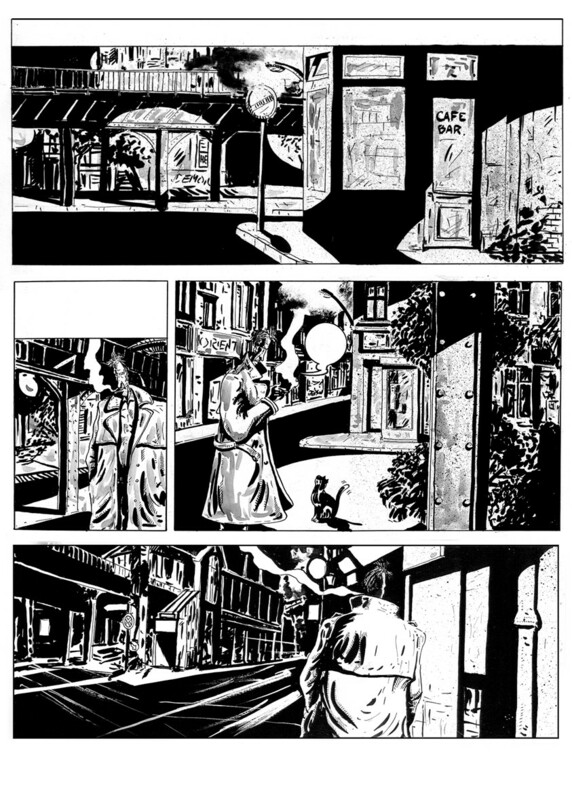 Paulo and Lothar begin to seek Julio who has disappeared among the dark silhouettes of the city. KANAKE: word which comes from the Polynesia and means in the native language "Man". It was said about the ones coming from the south islands. In Germany was understood as a discriminate adjective for the foreigners coming from the south. Muchos lo llaman "Kanake". Su verdadero nombre es PAULO FUNES. Frecuentemente se lo encuentra en el bar bebiendo un “espresso” doble y fumando sin pausa. Lothar Ioselliani, detective privado y su jefe, le cuenta de un tal señor Borges, un rico industrial argentino que busca a su hijo, Julio. Paulo y Julio se conocen, son viejos amigos. Antes de que el camino de sus vidas se separaran bebieron del mismo vino y amaron las mismas mujeres. En Europa, y en un Berlin donde las sombras son omnipresentes, Paulo Funes es visitado por el pasado y sus fantasmas. Paulo y Lothar comienzan a buscar a Julio que a desaparecido entre las oscuras siluetas de la ciudad. "KANAKE": Palabra proveniente de la polinesia y que en el idioma nativo significa "Hombre". Se decía de los provenientes de las islas del sur. En Alemania discriminante adjetivo para extranjeros venidos del sur. 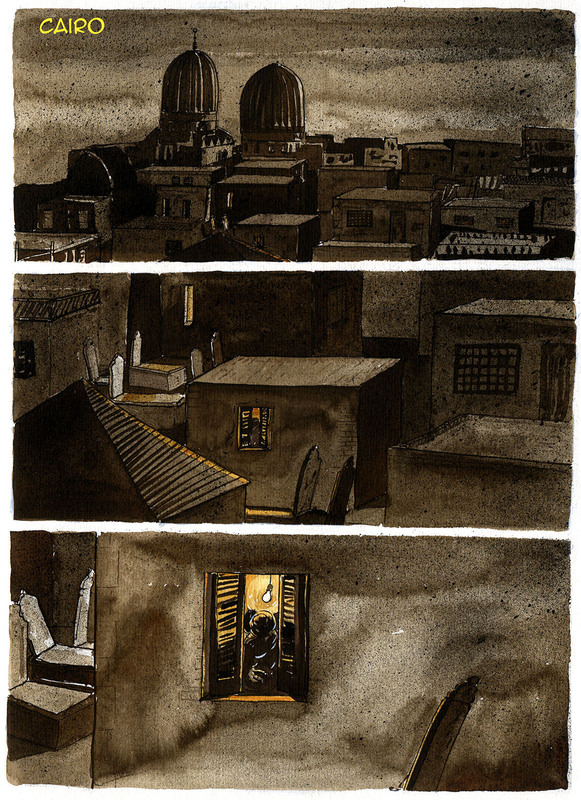 The second story of Paulo Funes has a lot to do with the Arabic culture and its relation with the European culture. 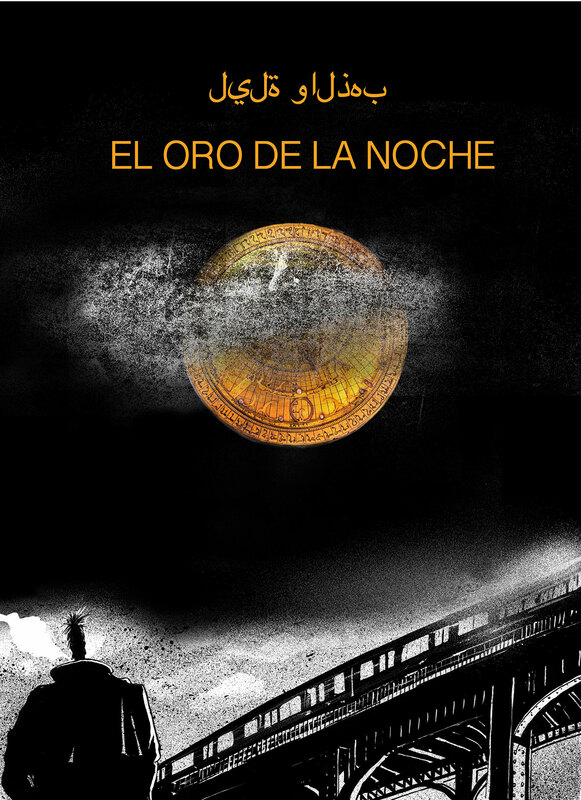 The story carries the title: THE INFINITE NIGHT and was carried out in the period of two years. 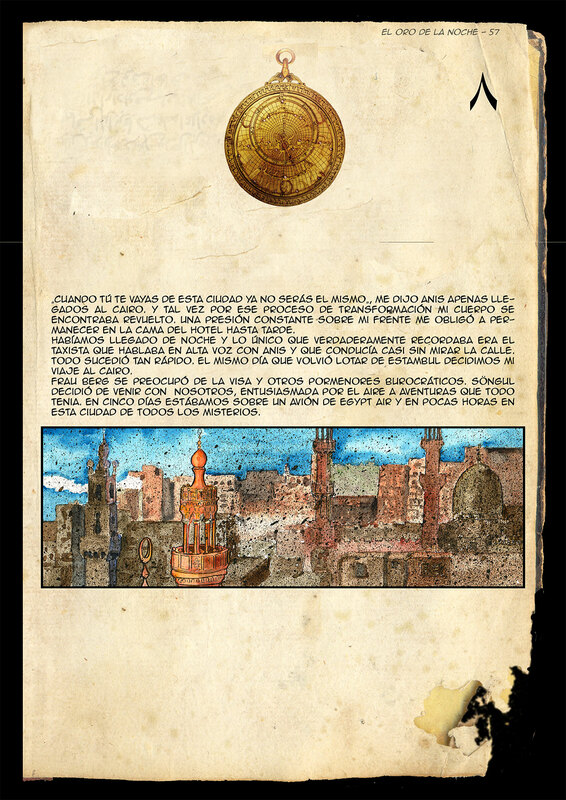 The idea, whose doubtless inspiration owes himself to the writings of Jorge Luis Borges, is born in form of a manuscript that imitates the style of the old medieval Arabic manuscripts and carries the suggestive title: "THE NIGHT OF GOLD". 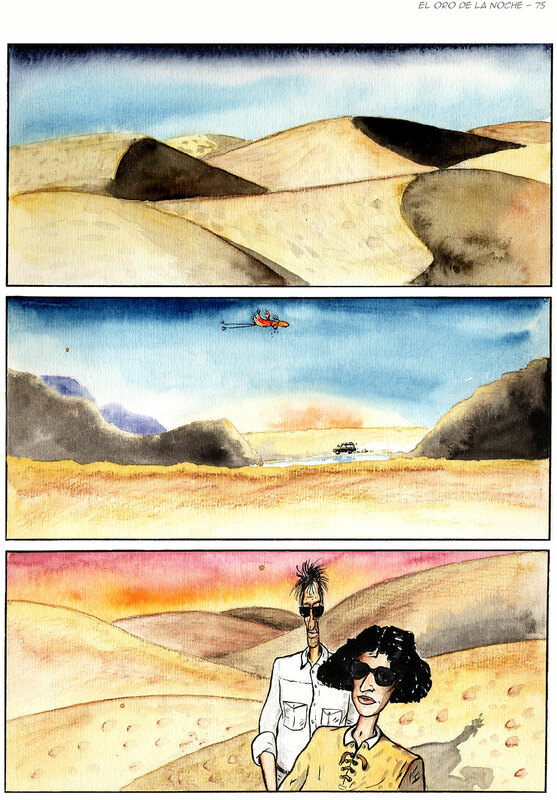 It is this mysterious one manuscript which was found in the desert and so initiates this police novel in form of comic that develops itself between Berlin, Istanbul and Cairo and whose mystery carries us to the desert of the Sahara. Fundamental protagonist is also an Astrolabe of gold that among his coordinates which imitate the movement of the stars keeps a secret of centuries. La segunda historia de Paulo Funes tiene mucho que ver con la cultura árabe y su relación con la cultura europea. La historia lleva el título: LA NOCHE INFINITA y fue realizada en el termino de dos años. La idea, cuya indudable inspiración se la debe a los escritos de Jorge Luis Borges, nace en forma de un manuscrito que imita en estilo los antiguos manuscritos árabes del medioevo y lleva el titulo sugestivo : "LA NOCHE DE ORO". 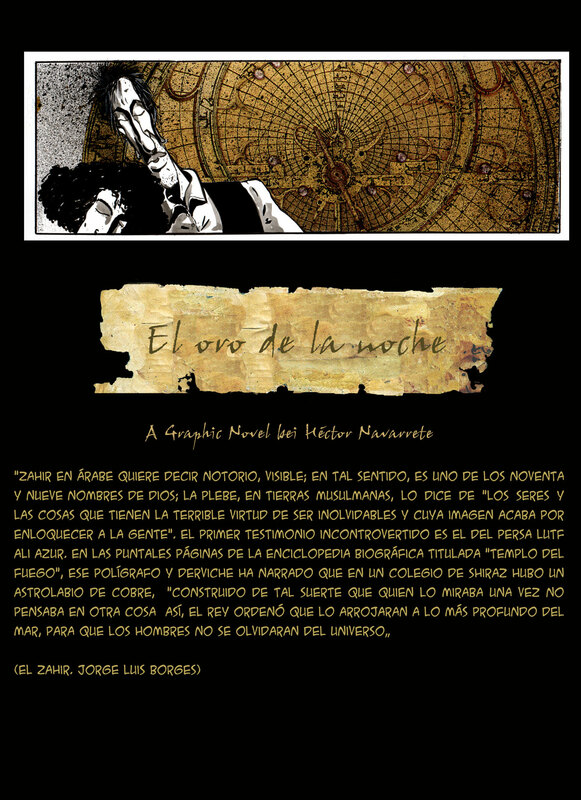 Es este misterioso manuscrito que al ser encontrado en el desierto da inicio a esta novela policial en forma de comic que se desarrolla entra Berlín, Estambul y Cairo y cuyo misterio nos lleva hasta el desierto del Sahara. Fundamental protagonista es también un Astrolabio de oro que entre sus coordinadas que imitan el movimiento de las estrellas guarda un secreto de siglos. Copyright © 2016 Héctor Navarrete/ hector-navarrete.de.